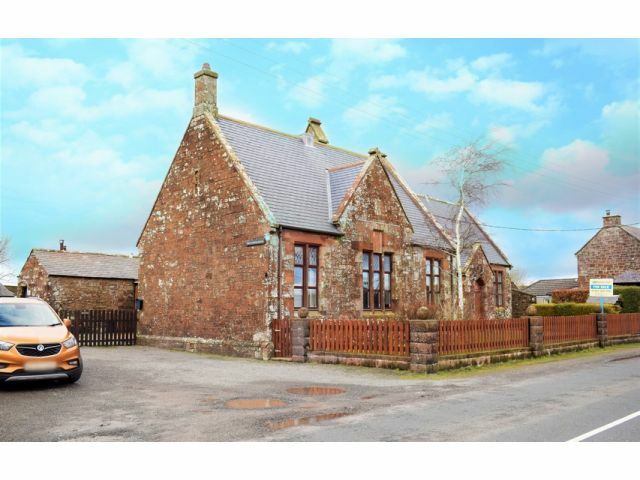 This former school house is situated on the B722, providing excellent access to the M74 North & South yet enjoying a quiet, country position! Belltower House lends itself to be utilised as a B&B or for a person who has an art & craft busines and works from home. The flexible accommodation comprises of a generous Sitting Room with feature Wood Burner, Second Reception / Dining Room (with original wooden floor under the carpet) , Kitchen, Utility Room and Cloakroom. There are Four En Suite Bedrooms and a further Bedroom / Office / Study. Outside there is a generous amount of off road parking, lawn and landscaped areas to the front and an enclose rear yard with a range of outbuildings. Two ceiling lights, four wall lights, walk in storage cupboard. Two radiators, carpeted flooring. Two windows to rear with curtain rails and one window to side. Half panelled walls. Three ceiling lights, four wall lights, picture rail, TV point, telephone point. Feature wood burner with tiled hearth. Two radiators, carpeted flooring. Window to side. Coving, ceiling light. Range of fitted wall and base cabinets, pull out pantry cupboard. Rangemaster and cooker hood extractor fan. Stainless steel sink and drainer with mixer tap, plumbing for dishwasher. Tiled splashback. Space for fridge freezer. Radiator, vinyl flooring. Window to side. Coving, ceiling light, four wall lights, TV point. Radiator, carpeted flooring. Window to side. Ceiling light, wash hand basin and toilet. Radiator, tiled flooring. Window to front with blinds. Ceiling light, range of shelves. Sink and drainer, plumbing for washing machine. Radiator, vinyl flooring. Window to rear with curtain rail. Ceiling light, picture rail. Electric radiator, carpeted flooring. Window to rear with curtain rail and blinds. Half wood panelled walls. Ceiling light, two wall lights, extractor fan. Suite comprising of toilet, wash hand basin and shower cubicle with electric shower. Electric radiator, tiled flooring. Window to front with curtain rail and under window storage. Ceiling light, four wall lights, picture rail. Electric radiator, carpeted flooring. Window to front with blinds. Ceiling light, three wall lights, extractor fan. Shaving point and light. Suite comprising of toilet, wash hand basin and bath with over head electric shower. Electric radiator, vinyl flooring. Windows to front with curtain rails and blinds and internal window to hall. Ceiling light, three wall lights, built In double wardrobes. Electric radiator. Window to side with curtain pole and blinds. Full wood panelled walls and tiled splashback. Ceiling light. Suite comprising of toilet, wash hand basin and bath with shower tap attachment. Radiator, vinyl flooring. Window to rear with curtain pole. Coving, ceiling light, two wall lights, TV point. Radiator, carpeted flooring. Window to side. ¾ tiled walls. Recessed lighting, one x three spotlight, extractor fan. Suite comprising of toilet, wash hand basin and shower cubicle with electric shower. Heated towel rail, radiator and vinyl flooring. Off road parking for numerous vehicles. Enclosed front garden with lawn, patio and landscaped sections with mature planting. To the rear there is an enclosed low maintenance chipped area with various outbuildings. Outside tap and outside lighting. Mains water, electricity, oil and private drainage. Offers in the region of £270,000 are invited and should be submitted to lj Residential, 93 High Street, Annan, DG12 6DJ or by fax to: 01461 205037. Should be Viewed to be Appreciated!